The pagan and Wiccan traditions are rich in interesting symbolism that can inspire tattoo designs that have deep meaning for the wearer. Here's a list of pagan and Wiccan tattoo ideas to get you started on some body art that's both beautiful and significant to you. Typically encircled, the five-pointed star known as a pentacle or pentagram represents earth, water, air, fire, and the spirit. It serves as a symbol of the Wiccan faith. The circle around a pentagram represents protection and the ever-changing, everlasting circle of life and nature. As an unbroken line, the circle also nods to the ideas of eternity and infinity. Wiccans always depict pentagrams point-up rather than point-down. This is because the latter is the Sigil of Baphomet in Satanism. 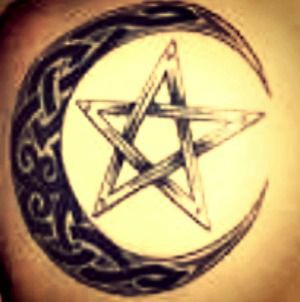 Therefore, if you opt for a Wiccan pentagram tattoo, it's absolutely crucial to ensure your pentagram is situated properly. The pentagram in early Christianity also depicted the five wounds of Jesus. The pentagram is also a common motif in Freemasonry. Fist discovered scribed on the ancient runestones in Northern Europe, the triquetra is ascribed to pagan and other varied roots but is generally understood to be a Celtic symbol. It's a beautiful entanglement of three petals—a petal being a symbol of Goddess. The symbolism of the triquetra has expanded to represent any combination of three elements, such as the past, present , and future. Triquetra designs make novel choices for sisters and other family members. In Ireland, this graceful triple knot bears a promise to love, honor, and protect; it's often engraved on rings, necklace pendants, and other trinkets. In Christianity, the triquetra symbolizes the Holy Trinity: the Father, the Son, and the Holy Spirit. In Paganism, the triquetra usually represents the Mother, the Maiden, and the Crone. Noble in many cultures, dragons are believed to hold the wisdom of the earth and are considered the most powerful and luckiest of all creatures in folklore. A less commonly practiced form of Wicca is Draconic Wicca, which combines Wiccan with Dragon Magick. Similar to calling upon the aide of gods and goddesses, Dragon Magick evokes the power of any one of different dragon personalities that number in the hundreds; the choice of one depends on the desired result. For example, you might request the assistance of the Red Dragon, who is the goddess of all dragons and therefore the most magickal. Dragon tattoos are still one of the most beloved mythical designs. You'll find lots of inspiration online and in the portfolios of tattoo artists. The pagan faith celebrates thousands of gods and goddesses that can be portrayed in a symbolic tattoo design. Many Wiccans seek a particular pantheon or deity that might be of Greek, Hindu, Chinese, Roman, or Celtic origin. If a god is the choice, it's typically a horned one such as Pan, who embodies all aspects of masculinity and sexuality. Women often choose a representation of the triple goddess or Mother. Many gods and goddesses make excellent choices, and you can even borrow from and merged their likenesses to form a design that fits your personality. For example, Epona is the Celtic horse goddess associated with fertility, while Lenus is a Celtic healing god. You can choose one, both, or a combined design to symbolize your efforts toward reproductive health or desire for a healthy baby. For the most meaningful tattoo, research and connect with the god or goddess that is most appropriate for your personal needs, situation, and values. The sun, moon and stars make an appealing New Age statement. To focus your energy or to encourage meditation, a celestial tattoo is an attractive choice. Place this sort of design anywhere you can see it, such as the inner arm, leg, or ankle, and you'll have a useful focal point for prayer, chant, or just everyday inspiration. Moon gods and goddesses—or those associated with witchcraft, such as the ancient goddesses Hecate or Isis—are also appropriate, popular choices. Depicted in a cameo design with stars and a beaded chain, this makes a beautiful jewelry-style tattoo that any ​Wiccan lady would be proud to wear. Replicate this style in a slave-bracelet hand tattoo, and you'll have a touch of magick right at your fingertips.